When I started looking into which sewing machine I should purchase and where I should purchase it from, I found and received an abundance of advice. This advice in fact was so abundant that it became not only overwhelming, but also completely redundant in its usefulness. To be cheap. The purpose of the machine was to save money by up-cycling things that I already have. It needed to be good enough for the job at hand but in the likely even that my learning to sew was a failure I didn't want to waste too much money. To be local or to be lightweight, so that I could bring it in my suitcase on my next visit to the UK. To be simple. 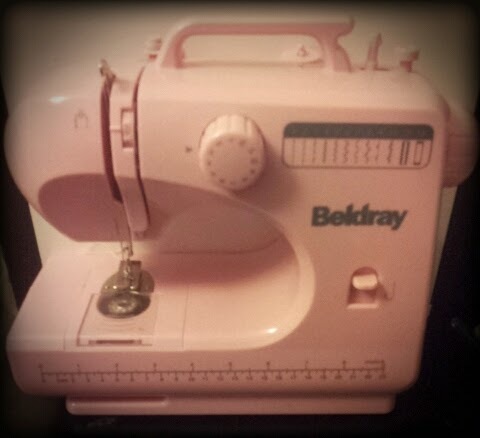 I already knew that I was terrified of sewing machines. I didn't want to have a panic attack when I first sat in front of it and I wanted to be able to conquer it, rather than it conquer me! (At this point I was still doubtful about who or what would win). To have very few bits that could easily break. This also meant that I wanted a machine with manual and mechanical settings rather than electronic settings. To have a very small number of settings and functions. I wanted to learn to sew. I never had any expectations of being able to sew well or to learn more than a handful of stitches of techniques. In the event of such a miracle occurring, I could, of course, upgrade. To be easy to use. Actually it needed to be more than a little bit idiot proof. I think perhaps that if I had found one with voice control that would have suited me well. The memories of hours trying to thread machines at school before even attempting to sew still come back to haunt me and it has been many many years since I was at school. At this point, if I could sit in front of a machine and learn to thread it, it probably would have been enough to keep me going for a while, in the way of achievements. After some time planning and dreaming I actually started to look forward to the big day. The decision was made to go ahead, the seed was planted - but I needed to wait a few months. Following in the tradition of Fiddler on the Roof's Motel Kamzoil, I would like to introduce my new arrival.